I received this in the mail from our friends at Tuttle Publishing last week, and couldn’t wait to share it with you! This is the latest book to be translated to English from Yoshiko Tsukiori that is full of patterns for ponchos, capes, coats, jackets, all the stylish ways you can keep yourself warm. You may think it’s strange to release a book about cold weather wear right in Summer, but given the time you might take to buy the book, look for the right fabric, and actually get started on sewing, it is just about right. I have prepared a flip-through book video at the end of this review where you can look at all the designs contained in the book, so I will just share some of my favourite pieces here. I just love the cover of this book. Despite the 34C temperature here, I actually feel cold thanks to the tones of the photograph and how snug she looks in that grey wrap. This is a drape vest, it comes in a drape jacket version too (with sleeves) but I thought this was a much better pictures. I love the draping and how being a vest it can actually be used more frequently as than a proper jacket. I also looks like a quick and easy sew. There are full length proper, really warm looking quilted jackets in the book as well, but I like this wrap which uses quilted fabric. Another really easy cut and finish edges, add snaps pattern. I love quilted fabric but find that using them full blown on a jacket makes one look rather like a walking blanket. This is much cuter! A stylish wrap in faux fur of course! If you have never sewn with faux fur before, there is a two page guide in the book with step by step photos teaching you how to do it. I love the casual look on this one, layered over a dress or even a defined pant suit, I think this falls in the category of refined casual wear. Might be easy to go sloppy on this one so I think accessories are very important when co-ordinating with this wrap jacket. A more feminine style bolero with tie ribbons in the front. Probably more suited for warmer days due to the length. This can be done in a light and sheer fabric as well to carry off the gathers and frills. A wing-collared jacket made in tweed fabric and fringed edges. Now for the technicalities. 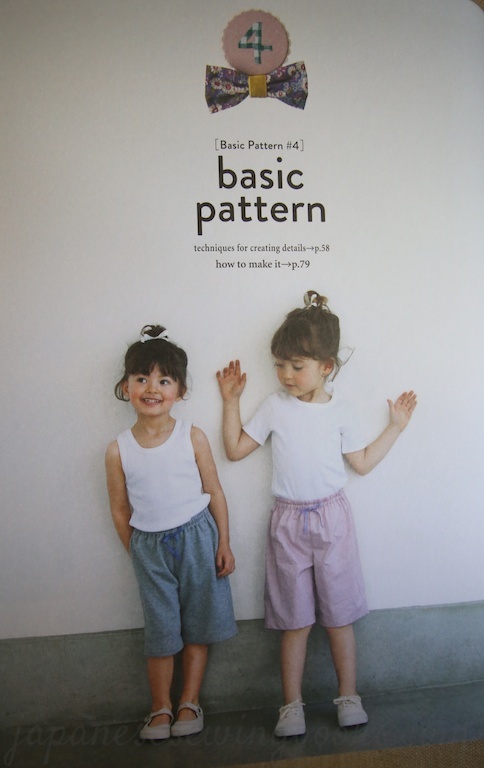 This book includes patterns for Japanese sizes 7 – 13. The measurements are given primarily in inches, and cm equivalents in brackets. A typical pattern how-to-make page. I just noticed that there are some bonus knitting patterns included. For e.g. the yellow beret worn together with the drape vest above, as well as the mittens on the cover of the book. There are also knitting instructions for leg warmers, headband and other accessories shown with the main garments. The diagrams below are from a sample of the instructions. I love making these book flip-through videos because it makes it so easy for me to show you what’s in the book compared to taking 2 dozen photographs. I hope you enjoy watching them too! Do subscribe to my YouTube channel Japanese Sewing Books to be updated when new videos have been uploaded. Here’s the flip through video. Enjoy! The book will only be available on Amazon.com from 1st August but it’s available for pre-order now! All you have to do is comment below and tell us your favourite book from Yoshiko Tsukiori. Need a list of books? Check out my book reviews of her English books here. One comment per email please. Extra entries from duplicate emails will not be counted. Like my Facebook page and comment on the giveaway post. Follow me on Instagram, like the giveaway post and Tag at least 3 friends to win. One tag per comment. The more friends you tag, the more chances you have of winning! This giveaway will run for a week and end Monday 10th July at 0900hrs Singapore Time. The winner will be announced the day after on the respective channels. ETA : The giveaway is now closed. 3 years ago I bought this book while holidaying in Japan, called Sewing Recipe for Girls, by one of my favourite author/pattern designer Yoshiko Tsukiori 月居良子. There is also an adult version of this book called Sewing Recipe. The books are designed to function not merely as pattern books, but also serves as reference books as well. The books cover a wide range of sewing techniques from basic to advance, that you will need to learn to sew up your own wardrobe. The sewing techniques are presented in step by step photographs which made it easy to understand, but the accompanying explanatory text was in Japanese. So imagine my excitement when I found out that the Girls’ version of the book was going to be translated to English! The books are almost identical in terms of content, but the front and back covers have been changed. Oh, the title has been changed as well. In Japanese, the word レシピ (pronounced re-shi-pi, a term borrowed from the English word recipe) is not only used for cooking recipes, but also to refer to instructions on how to prepare/make something. For example “Handmade Recipe” – meaning how-to-make procedure for handmade crafts. So it’s not strange to see it on a Japanese book as a book title, but I guess it will be strange to use it in reverse, i.e. on an English book since “recipes” usually refer to cooking recipes. So the editors have thoughtfully changed it to a more self-explanatory title. “Sewing for your girls”. A quick look at the contents page – there are 8 basic patterns, with 1 or 2 applied patterns for each of the basic patterns. As you can see from the contents page, there are many many pages dedicated to sewing techniques. I did not cover each individual basic pattern in my review previously, so let’s take a better look at each of the patterns as well as some of the sewing lessons. Before we begin, here is the size chart for the patterns included in this book. Like all the other translated books, the main measurements are given in inches with cm equivalents in brackets. The first basic pattern (see above) is a basic A-line dress with frills on the shoulders. To make it simple, for both the one sewing as well as the one wearing it, the dress has a front neck slit and closed by a ribbon tie on the front. No complicated zips or buttons to fiddle with. A great dress to begin with if you are a beginner. The first sewing lesson is based on basic pattern #1, includes all the steps, from transferring patterns, cutting out fabric, marking the symbols on the fabric, and even how to use a sewing machine! So even if you are not making basic pattern #1, this will be useful for you! At the end of each basic pattern, the applied patterns are presented. There are 2 applied patterns for patterns #1,2 and 6, and 1 applied pattern each for patterns #3,4,5 and 7. Basic Pattern #2 – Basic blouse with puffed sleeves and back enclosure with buttons. Note how for each basic pattern, the finished projects are presented in both printed and solid color fabrics. This was done intentionally by the author so that it can help you imagine your own designs and visualize the clothes in different types of fabrics. Basic pattern #3 is a dress with smocking on the front yoke. Smocking is a technique used a lot in girls clothing. Yup, you learn how to make real hand-stitched smocking and not the “fake smocking” effect using elastic thread. Applied pattern #3 shares the same basic pattern as pattern #3 but looks rather different. Instead of smocking, the front yoke panel is gathered instead. The sleeves are also lengthened with added smocking details along the sleeve extension. A contrasting ribbon tape is sewn around the neckline for decoration. Basic pattern #4 – A simple drawstring pants pattern made in sweatshirt (jersey knit) fabric that will be perfect for lounging in. Modify this pattern on your own to create easy to wear shorts or long pants in any fabric of your choice. Applied pattern #4 uses the same pants pattern from basic pattern #4 but with an added bib + straps above the waistline, and therefore creating a new outfit – overalls. Hidden side pockets and a back pocket were added as well. Pattern #5 is what I called the “fake smocking” effect. From far, it looks like the top part of the bodice was smocked. In actual fact, the fabric is gathered not by hand, but by using a shirring elastic. I have made these dresses many times and my girls love to wear them. These dresses are made up of simple rectangles for the front and back piece, and two more long and thin rectangles form the straps. They are very easy to sew, except that you have to wind the shirring elastic by hand with a slight tension. It may take a couple of experiments to get the correct effect so if you are doing it for the first time so do try it on a scrap piece of fabric before sewing on your actual piece of fabric. The applied pattern is a simple adaptation. A lengthened skirt with tiers using co-ordinated fabric. Pattern #6 is a Long sleeve smock blouse with elastic gathered neckline and sleeve openings. Easy to wear and comfy too! The applied patterns for #6 are 2 rather different designs. One is a cap sleeve with contrast ribbon tie detail on the front, the other is a sleeveless camisole like top. You can’t see it in this picture, but there is an added layer of tulle over the fabric for applied pattern b. Basic pattern #7 – round collar sleeveless blouse with frill details on the front bodice and buttons down the front. The tops are slightly flared towards the hem line for ease of movement. Applied pattern #7 is a lovely linen dress with a sailor type collar and a button down opening halfway down the front. I’ve always wondered how to make these half button placket kind of things but no worries, there is a sewing lesson on that too. There are also embroidery details on the pocket as well as the collar. The patterns for embroidery as well as instructions for the stitching methods are included. Basic pattern #8 is a poncho style blouse which is great for layering over a plain top as outerwear. The hems of the flared sleeves and bodice are lined with ric-rac tape. After seeing all the patterns offered, it’s time to get started on sewing! The next section covers all the basic techniques you will need for the garments in the book. Unlike the sewing lessons accompanying basic pattern #1, the photos are in black and white, but still in great detail as you shall see. There are 32 pages devoted to these step by step photos on various sewing techniques, from something as simple as hand sewing buttons to attaching a collar, inserting an invisible zipper, or a partial opening (like the half button down opening for applied pattern #7) The full list of sewing techniques can be seen on the content page. Example of step by step photos for sewing techniques. The last section contains the detailed instructions for all the other basic patterns and applied patterns. Each page includes the Materials list, Instructions, Cutting layout, as well as a order of make diagram. Close up of the order of make diagram. Follow the numbers in the order given to complete the garment. As all the sewing techniques are compiled within one section, you will notice that the instructions do not have detailed diagrams for each step, instead you will need to refer to the respective pages under the sewing techniques. At first this may seem rather troublesome, but after a few projects, you will be so familiar with some of these techniques, you will have no need to refer to the techniques anymore. There are 2 full size pattern sheets, printed on both sides for a total of 4 sides. Attached to the back cover is a handy pocket for storing your pattern sheets. And last but not least, the back cover has also changed. Now it includes more photos of the projects, as well as a quote by yours truly! The people at Tuttle saw my review from 3 years ago on the Japanese version of the book and asked me if they could quote me on the English version. But of course! 🙂 For me, this was truly the most exciting part about getting the English version of the book! A big shout-out to the lovely folks at Tuttle for sending me this review copy and having my quote on their book. Next week, another newly translated English book review. It’s a book that I have reviewed before and even did a pattern translation from it. Some of you have emailed me regarding this book so I think you will be excited to see the English version of it. Stay tuned! Yay! Another book by Yoshiko Tsukiori has been translated to English by Laurence King. This time it’s for the girls. We’ve seen many of her adult sewing books being translated to English, but Yoshiko Tsukiori has authored many books for girls as well. I was so excited to hear that this was translated to English and even more excited when Laurence King sent me a copy for review. This particular book was one of the first books I bought when I first started sewing for my girls. It was first published in 2007 which is like 7 years ago??!! Brings back lots of memories…. The original Japanese version on the right. I like this better because you can tell at a glance, what patterns are included in this book. As with all translated versions, the main measurements are in inches and the cm equivalents in brackets. The size chart even has a US/UK size guide chart which is a pretty useful estimate if you are sewing for someone else as a gift and can’t get hold the actual body measurements without spoiling the surprise. Now let’s take a look at the garments you can make in this book. Before we start I must confess that I bought the book because I loved the photography and prop styling in this book! You can hardly tell this book was first published in 2007. Many of the garments were also made using Liberty prints and you can see how well both the pattern designs as well as the fabrics themselves have stood up to the test of time. The shoulder straps are actually separate straps (like rabbit ears) tied to form bows. The box pleat adds to the roominess of the garment, making it both easy and comfortable to wear. The neckline is finished with a pretty ribbon bow tie. This is the longer dress version of the box-pleat tunic, and this particular dress is made in lightweight wool. As the armholes and neckhole is pretty roomy, this serves as a great layer-on dress for cold winter days. I just love the pretty bolero with a ribbon tie (she was really into ribbon ties then wasn’t she?) and also the girly ruffles on the flared sleeves. The skirt features tucks in the front and a elastic waistband in the back for easy wearing. The contrast bias is made with gingham fabric. This skirt is pretty much the same as the skirt in d, but there is an additional layer below, made with the same floral fabric used for the waistband and pocket bias binding. f – Square neck blouse with pin-tucks. This is a really sweet blouse with pin-tucks on the front of the blouse. The book recommended the use of striped fabric to make it easier for folding the pin-tucks. If you have ever made pin-tucks, you will know how difficult it is to be completely precise, so yes using a striped fabric does make it much easier. But you can make this in solid fabric as well. This will make a really sweet and versatile piece in a white cotton fabric don’t you think? Something cool and easy to wear for warmer days. Hey, ribbon ties again! 🙂 I do love the fabric combination don’t you? This top is pretty and girly with the gingham ribbon ties and ruffles at the hem. A simple A-line dress is a staple piece in every girl’s wardrobe. The cap sleeves allow lots of room for movement and will be lovely for a play dress. One of those dresses that your girls will wear over and over again since it is so comfortable. Oh, and guess what? The back closes with a ribbon tie! Another wardrobe staple as well as a pattern staple. I must have made more than a dozen of these bodice+skirt dresses in both sleeveless and sleeved versions. This version is with cap sleeves. With a basic pattern like this, you can create a casual or formal look depending on your choice of fabric. In the example above (in Liberty print no less), the dress is jazzed up with a lace band to the yoke. A long sleeve version of the cap sleeve dress. Similar in construction except for material (this version is using lightweight wool), and the elastic cuffs giving it a nice puff sleeve look. This will look gorgeous in a more formal fabric, and can definitely be adapted to a formal occasion dress for a little girl! Similar to a peasant blouse, this is another easy to wear top that your little girl will love. The above is made in lightweight wool and will be perfect for cold weather. But if you use a cotton lawn or linen, it will be perfect for summer days as well. The back is enclosed using loops and buttons (yay! no zips), and there are even instructions on how to make the thread loop in the proper manner using chain stitch over two strands of embroidery floss. Together with this outfit, there is also a pattern for a simple pair of pants with an elastic waistband and drawstrings detail on the cuffs. I looked up the definition of a smock. A smock is meant to be an outer garment, for protecting your clothes while you are playing or working. Really? I can hardly bear to use this pretty piece as in place of an apron. This square neck smock in lightweight wool has a decorative ribbon sewn along the neckline for added style. A dress variation of the smock (l) with ruffle sleeves and the addition of a patch pocket. A wide lace band runs around the neckline and the top opening of the pocket. Don’t you love it when you get patterns for the entire outfit as-shown? The postboy cap (is that what it’s called?) is too cute. I’m sure lots of you mummies of boys will want to steal this pattern just for the cap. The pants is a basic elastic waistband pattern, but with practical box pleat pockets running along the side seams. The open neck blouse itself is super easy to wear since there is no enclosure but a front slit opening. Lovely for layering over a camisole or on its own on hot days. The book title says Girly Style Wardrobe, so of course a girl must have a little girly purse to carry her little trinkets around. This pattern is for a metal clasp purse with instructions on how to attach the metal clasp (sewn-on type) to the fabric purse. A simple layered skirt with an elastic waistband for easy wearing and a ribbon tie detail on the front. A hooded parka made in wool, enclosed in the front using snap buttons instead of a zip, embellished with a wide lace band around the hood and the top opening of the patch pockets. As for the skirt, it is made up of 3 tiers, with a 1cm wide ribbon sewn on in between the tiers, and a ribbon tie detail in between the top two tiers. This dress was made in wool, with a wrap-top effect on the front yoke, and wool lace added all around the neckline and hem. The back encloses with a zip, and there are graphical instructions for attaching a zip properly. There is also an additional pattern for a drawstring pouch made using the same leftover fabric. A vintage style dresses with puff sleeves. Love the sweet sweet fabric on this one! This dress is super girly with lots of ruffles and gathers. Ruffles along the sleeves, gathers along the waist and ruffles along the hem. This is not a two layer skirt, but the ruffles are sewn attached to the hem. The added ruffles will make the skirt stand out more and I know fir a fact that little girls love to twirl in such skirts! The how to make section includes the usual material list, instructions, cutting layout diagrams. You may find that the text instructions are really short and sweet, and you will realize why this is so if you refer to the original book in Japanese. The original instructions are that simple! Straight to the point, and rather minimalistic. But it’s perfectly fine since the steps are illustrated in diagrams which are very detailed and easy to understand. The diagrams in the Japanese version. Patterns are conveniently enclosed in a plastic envelope attached to the back cover of the book. There is one last pattern which was not labelled, which was not fully shown on any page except the back cover, for a slip dress that can be used under dress S (the vintage puff sleeve dress). The length is designed for the white ruffles to peek out under dress S. As this is meant to be a slip, there are no zip/button enclosures but a wide neckline and large armholes, for easy slipping on and off. I hope you are as excited about this new book as I am! Get yours today! This book will be released 3rd February on Amazon but is now available for pre-order. Those of you in UK or Europe can also purchase it from Laurence King’s website, it’s already in stock and there’s free UK delivery. Those of you who visit my blog regularly may have realized that I have been slow to update recently. My eldest was having her exams and I know it sounds ridiculous but it meant that I was not able to blog and sew as often as I liked since our “work areas” are next to each other and whatever I was doing distracted her from her revision (which was obviously a lot less interesting that whatever I was doing). The good news is, the exams are officially over and it means I’m back to regular schedule from next week onwards. Anyway for this week I wanted to review another translated book by Tuttle. I once borrowed the Japanese version of this book from my friend, just to trace the pattern of the dress on the front page. But I never got around to making it because I did not have the right fabric, and somehow time went by and patterns get piled up faster than I have time to sew. I don’t even know where the pattern is now 🙁 Looks like I will have to trace it again because every time I see this cover I feel like making this dress! 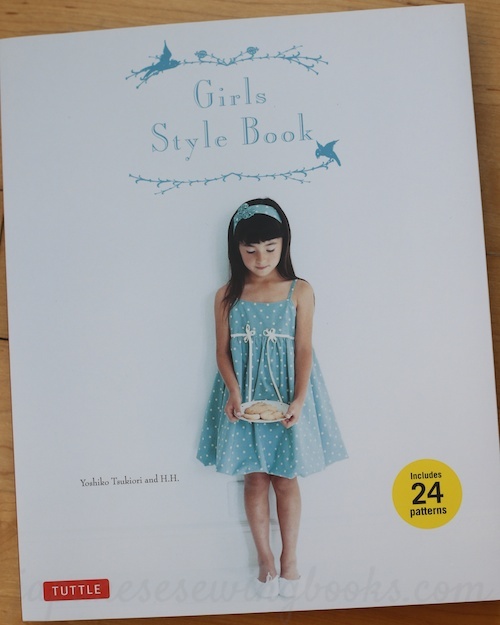 The book is called Girls Style Book and it includes 24 patterns for girls in the following sizes. Size 2-10 for heights 100-140cm. I’m so used to using cm so I’m really glad that they provide both sets of measurements even after translating. One reason why I don’t like sewing with english patterns is that I have to keep converting the units back to cm. Let’s have a look through the book now shall we? Dress with frilled collar. From the length it looks like a blouse but the title says dress. I guess you cane make it longer or shorter, it will work both as a blouse, tunic or a dress. Smock-like blouse with front tucks. Notice the gathered details on the sleeves and the scalloped edge lace on the hem. So so sweet! This is actually a variation of the blouse in B but in a longer length and in linen. Classic dress with a linen ribbon tie and rounded collars. Balloon dress with ribbon rosettes. Pattern for matching headband provided too! There is also another sleeveless balloon dress pattern (instead of straps) in the book so if you are a fan of the balloon dress, and have always wondered how to make it, you have to get this book! Puffed-sleeve A-line dress. You can vary the fabric used to give it a more casual or formal look. This fabric is a summer weight wool, and the trim is made using Liberty fabric. Patterns for the open back camisole, pants and the oh…the super cute hat are all provided! Blouse with front and back gathers. You can’t really see it from the picture because of the printed fabric, but it is a really pretty blouse with front pockets and frills on the sleeves. There is also a ribbon tie at the back enclosure. Blouse with gathered high waist, V-neck and frills on the shoulders. Do you like to use classic large floral prints on your little girls? It’s a really nice match for this pattern. Straight line sundress. The sleeves and top edge of the dress is made really pretty with some eyelet lace and a length of ribbon weaving through it. A very classic high waist gathered dress, a staple pattern for anyone sewing for little girls. A-line sleeveless dress. Easy to wear, and easy to make! Dress with embroidered front smocking and little bag. This pattern teaches you how to make the smocking pattern. Like in the real traditional needle embroidery method. It is tedious work but so pretty when finished. An interesting dress made using a decorative edge fabric. The edges are used for the sleeves and neckline panels as well as the skirt edge of the dress. You could even adapt this pattern using a plain fabric with a co-ordinating fabric for the neckline panel behind the V-shape bodice panels for a completely different look! For formal occasions, there is the long dress. The petal sleeves are beautiful! Be sure to use a fabric that has a bit of shape to help the petals stand out. The dress above is made in linen, but you easily create a more formal look by using a different type of fabric. A black linen bolero and pinafore ensemble. Wear it separately or together for a more formal look. The bolero pattern on its own will also be useful for cold weather wear or an extra touch to a formal dress outfit. Each of the patterns come with a set of instructions like the ones in the picture above. I don’t follow the cutting layouts strictly because I find that for smaller sizes, sometimes it is possible to use a lot less fabric than what is stated. But always refer to it before cutting out your patterns because you need to transfer the correct seam allowances to your patterns! The patterns include diagrams for instructions. A close up of one of the diagrams is shown above. Like all Tuttle books, there is a handy envelope at the back cover for storing your patterns. If you were to pick a pattern from this book for a sew along, which would it be?